I was going to write about tonight’s state dinner for Mexico and the amnesty plan, but we’ve got a national crisis here! I think somebody’s been snooping in this diary! The pages are all wrinkled! And the most personal entries are dog-eared! WHAT THE HELL’S GOING ON HERE? (WASHINGTON, D.C.) On May 20, 2010, Laura Ingraham received a package from an anonymous source that will change the history of the United States and the legacy of President Barack Obama. While retrieving her automobile from the underground garage at the Watergate complex (where she had just enjoyed her weekly pedicure), Ingraham discovered a manila envelope on the hood of her car. When she picked it up, a deep baritone voice called out from a nearby stairwell: "Just read it. You’ll know what to do." The shadowy figure then disappeared into the darkness without another word. The envelope contained copies of what appeared to be diary entries written by President Barack Obama, his family, and high-ranking administration officials. 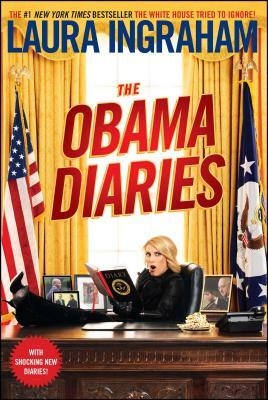 Because the "diaries" are so revealing, Ingraham felt compelled to release them to the American public and the citizens of the world. Major media outlets love to describe the president as "no drama Obama," but The Obama Diaries tells a different tale. Through these "diary entries," readers will see past the carefully constructed Obama façade to the administration’s true plans to "remake America." •Michelle Obama’s gardening and anti-obesity initiative; and much more. Informative and hugely entertaining, The Obama Diaries will inspire both laughter and critical thinking about the future of the nation and the man currently at the helm. Laura Ingraham is the #1 New York Times bestselling author of The Obama Diaries and Power to the People, the most listened-to woman in political talk radio as host of her own nationally syndicated radio program, a Fox News contributor, and permanent substitute host for The O'Reilly Factor. A former Supreme Court law clerk and white-collar criminal defense litigator, she lives in the Washington, D.C., area with her two children.